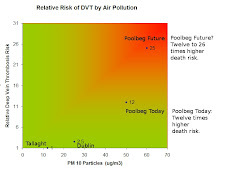 The Galway Tent Blog: Why Does EPA-Ireland Not Effectively Monitor Deadly Particles? Why Does EPA-Ireland Not Effectively Monitor Deadly Particles? In Pennsylvania newspapers publish real-time deadly particle data, with explanations. Real Time Data on Deadly Particles? 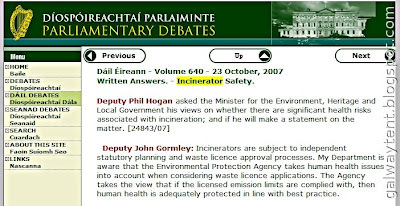 Why is an ex 10-year-EPA-Director working for the Waste-To-Toxins incineration industry in Dublin at Rathcoole and Poolbeg? Why did EPA-Ireland only issue a piece of paper about the Chromium-6 in Cork? In August 2008 people were observed using hand-held instrumentation in the Poolbeg Area. The instrumentation used X-Rays to analyse local pollution, including heavy metals. The researchers claimed not to be funded by the EPA. Apparently the results have not been published. Why? 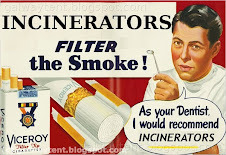 An incinerator is a gigantic deadly particle generator. Scientists and health experts have been unable to identify a safe level of exposure to these particles (“PM2.5”). PM 2.5 particles are about 30 times smaller than a human hair; several thousand of them could fit on the period of a typed sentence. Due to their extremely small size, particles travel deeply into the respiratory tract, reaching the deepest recesses of the lungs. Monitors can provide data on PM 2.5, a fine air particulate linked to a variety of heart and lung ailments, in real time on an ongoing basis. In Pennsylvania, pollution levels will be printed daily in the newspaper on the weather page and hour-by-hour updates will be posted on The Sentinel’s Web site. “By continually providing the level of PM 2.5, CAB and its partners are hopeful this will actually improve area resident’s health. There may be good scientists in EPA-Ireland. However, with the director level revolving doors between EPA-Ireland and the waste-to-toxins industry ... The Bush Administration threatens its own EPA scientists. Directors at EPA-Ireland do not provide actionable public data on deadly particles (“PM2.5, PM1.0”). It appears this is their “proof” there is no problem, an agenda of curious benefit to their future or past employers in the Waste-To-Toxins business. Generators of PM2.5 and of PM1.0 pollution such as power stations and cement plants are not identified and quantified. Real time data is not published. Health studies are not done to reinforce the "you have no proof" Big Lie. Apparently Covanta (Poolbeg & Luxembourg) & Covanta-Energy-Answers (Rathcoole & Virgin Islands) have hired an ex-EPA Director to “consult” with the government. Covanta wants two Waste-To-Toxins incinerators at Poolbeg & Rathcoole. Covanta has been fined for law-breaking (dioxins - at all plants in New Jersey). Tobacco companies have also hired 'consultants' from regulators. Do Drug Dealers hire ex-Gardai? Cork Harbour was polluted with Chromium-6 when the ex-Director was at the EPA, allegedly. Apparently EPA-Ireland just issued a piece of paper. Is this deception? Have there been deadly consequences in Cork?